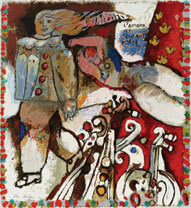 Theo Tobiasse was born in Jaffa, Israel, in 1927, shortly after his family arrived from Lithuania. However, they did not stay in Israel due to financial problems in resettling at that time, and moved again when Tobiasse was only 6 to Paris, where his father worked as a typographer. A shy and solitary child, Tobiasse attended his first primary school at Montreuil-sous-Bois, where his strange clothes and his Yiddish accent caused him to be laughed at by other children. He was only 15 when the Germans captured Paris, but he was fortunate in surviving the Nazi occupation by remaining shut up in a flat in Paris from July 1942 to August 1944. During this time Tobiasse retained his balance by depending upon his art, and after the war when he dared to emerge into the light, he had built up an impressive portfolio of work. 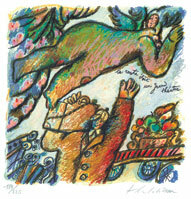 Although he had some brief training at the Arts Decoratifs in Paris before he was forced into hiding during the war, he developed his own style of depicting what is called in Hebrew "Simcha" the happiness of the sad. Still, in the oeuvre of his private collection there exists some of the most moving art reflecting his innermost feelings for the world around him during the holocaust. Always a private individual, Tobiasse still puts his innermost feelings into almost every painting. There is his little 'secret' entrusted only to his paintings: a personal message which he writes in Hebrew and then glues onto the canvas before painting or collaging with fabric over the message. He then completes his painting over it with no one to ever know the secret message (prayer?) without destroying the painting itself. 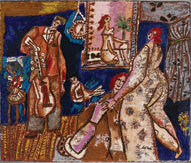 After the war Tobiasse created and designed windows for many of the sophisticated boutiques of the Faubourg St. Honore area of Paris, as well as designing tapestries for the Salon de l'Imagerie. For fifteen years Tobiasse worked to earn a living as a commercial artist in advertising, first in Paris and then in Nice where he moved in 1950. All of this time he turned to his paintings after work at night, often painting throughout the night. One of Tobiasse's first shows was an exhibition of young painters at the Palais de la Mediterranee in Nice, where he won the grand prize. From that moment Tobiasse, always a dedicated painter decided that his life would be devoted to his art and two years later, in 1962, he gave up his successful commercial career to devote himself exclusively to painting. Tobiasse has been honored by one-man shows at many important galleries around the world since that time.